Tricia's Take: Because EVERYONE is doing it! JOTD- Army green but not mean! OOTD- Lace and Burfday plans! OOTD- New Year's Eve Replay! Because EVERYONE is doing it! Growing up my mom used to tell me not to do things because everyone else is doing it. You know the old saying "would you jump off a cliff if everyone else was?" I used to tell my mom "yes, I sure would!" kind of a little sassy back in the day! Since I am trying to be better about not buying so much and spending less on myself I only got one thing during this sale! I know everyone is saying how that is one of their resolutions and I guess it's also become one of mine! I did pass on these two things on my wishlist. So thanks to all you wonderful bloggers out there that inspire me to try and be better! I really enjoy each and every comment you leave and that you take time out of your busy day to read my silly blog! Thanks! Something I know most of you don't do but I find such enjoyment out of is quilting. I have been busy finishing up a quilt for each one of my three kids and I wanted to share a picture of the finished product! 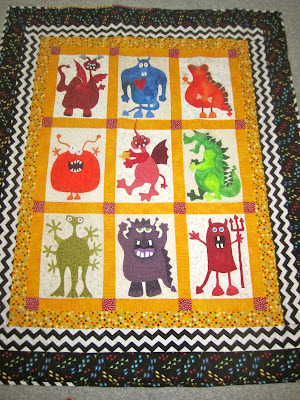 Monster quilt for my little monster! Here are the three little kiddo's with their quilts! If you had to get one thing from this sale, you sure picked a good one! I am actually wearing the Refined Cord dress today! I absolutely love it. Which color did you end up getting? Love the quilts. Your children will cherish those for the rest of their lives! I LOVE those quilts! They are absolutely adorable (the quilts and the little ones)! You are so talented, I wish I could complete ANYTHING like this! Those quilts are beautiful! What incredible talent you have. Your kids will surely cherish these for years to come!! 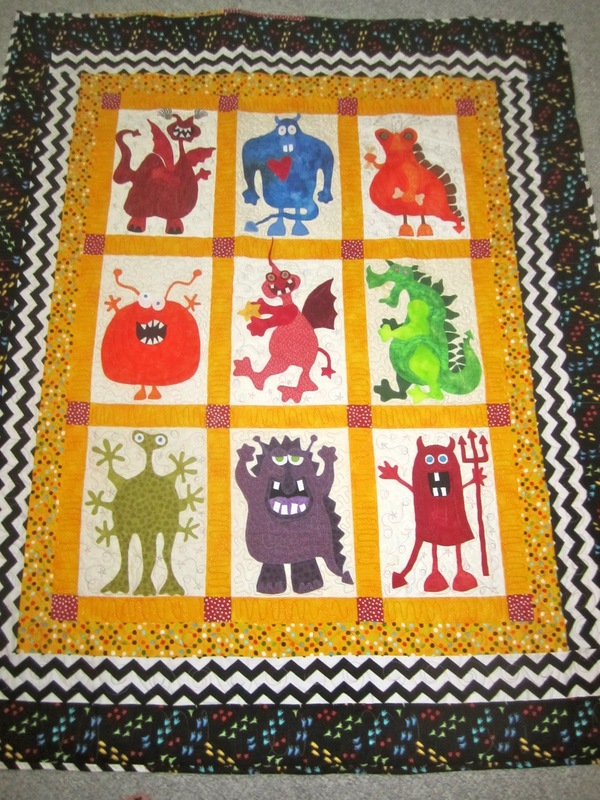 That monster quilt is incredible! Love it! I wish I was that talented. The quilts are beautiful - you do an awesome job. I'm sure those quilts are something your children will treasure for years to come! A stylish Mom and a talented one at that. Beautiful work. Good for you for sticking to your budget. It's all too tempting reading blogs all day but I like you am sticking to a budget too. I tell myself "just say no!" I do not know how you do it all! Those quilts are beautiful, I wish I could do that, but luckily I have a mom and SIL who make quilts for my kids so I will take it! When I checked (just now) the shirt dress was gone, probably better for me so I don't spend any money! The quilts are FANTASTIC - and I love your little cutie pies all snuggled up in them - what a treasure from their childhood to have quilts made by mom! I grabbed the cord shirtdress too.. I LOVE your quilts!!! John still sleeps with the one you made him! You are so talented! 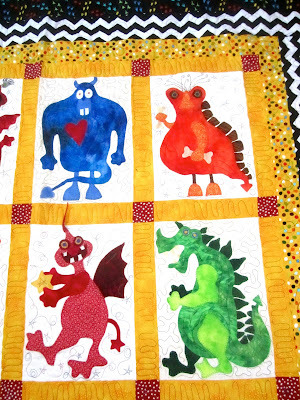 I love the little monster quilt! So adorable! I know a lot of us are trying to be good shopping wise right now, its good to know its not just me! Those quilts are amazing! I have a few friends who love the quilt so I know the time and dedication it takes to make one. Yours are so fabulous. Lucky, adorable kiddos...quilts for kids is a big business where I work...great job they look awesome Tricia. Dawn Suitcase Vignettes..
Wow! You are so talented! Your kids look adorable and very happy with their new quilts! 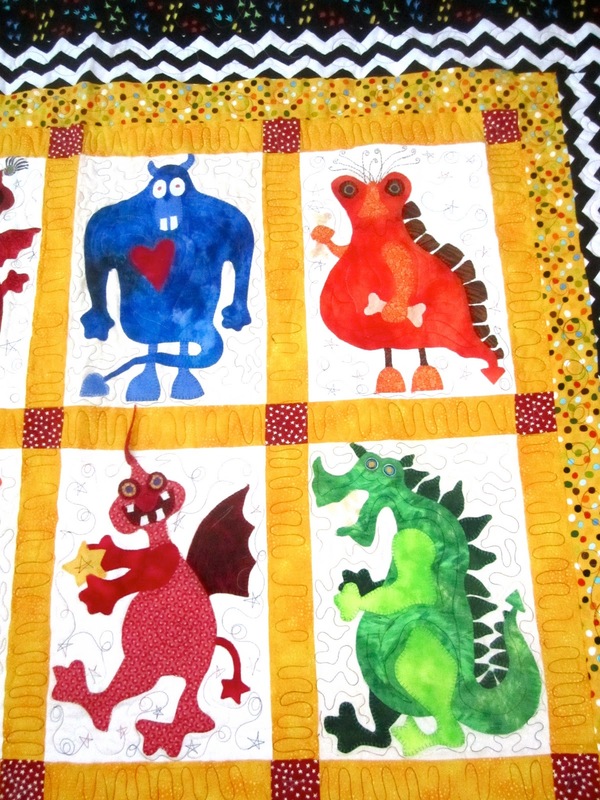 I love all of their quilts - you do such creative and beautiful work!!! hello amazing! those are simply beautiful. they look like heirlooms. they will love them for years and years!